You must have often wondered about the monks with shaven heads, a white robe and a fine muslin cloth covering their mouths and noses. They are monks who follow the Jain religion. They cover their mouths and noses to avoid any involuntary killing – even of germs. Sometimes they also carry small brooms to remove any small creature out of their way so that they do not unknowingly tread on it. Their lifelong attempt is to live by the principle of ahimsa or non violence. So it is with Jains who lead lives like you, me and others. 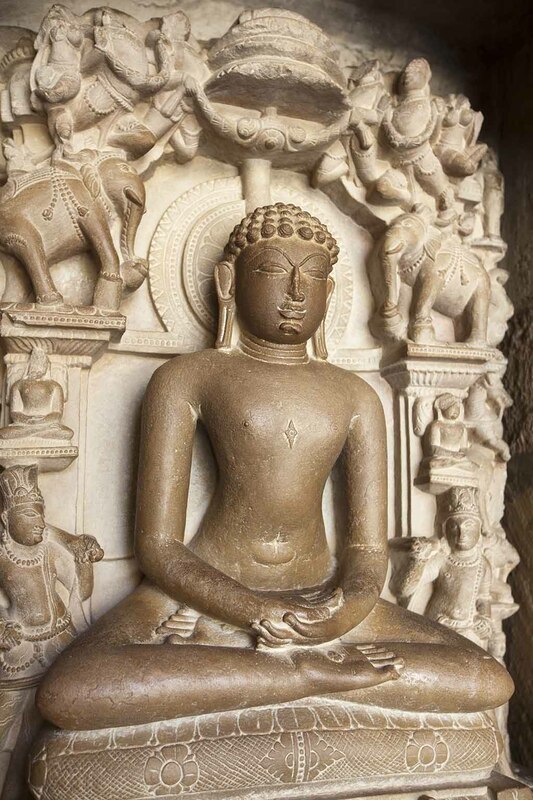 Jainism, a religion that originated in India in 6-5 century BC (about 2600 years ago), was founded by Mahavira. His birth anniversary, celebrated as Mahavir Jayanti every year, is the main festival of the Jains. The 24th and last in a line of preachers called Tirthankaras, Mahavira the teacher, as he was called, gave a concrete shape to ideas that had been voiced by the earlier saints. These ideas were a rebellion against the existing practices made popular by the priestly class of Hindus. It was one of the most interesting times in the history of the land we call India, specifically the Gangetic valley in present-day Bihar. Jainism was founded at a time of great social and economic upheaval in India. It was a period of transition, when an agrarian society was transforming itself into an urban-based one. This happened due to the rapid growth of trade and commerce in India which in turn led to the growth of towns and the expansion of a professional class of artisans and traders. The aspirations of these groups expressed themselves in new unorthodox ideas. They were voiced by people belonging to these groups. So, both Mahavira and Buddha belonged to the kshatriya class. Their ideas challenged the established Brahmanical aspects of Hindu religion and its endless rituals. Hindu caste hierarchy comprised of four groups: the brahmins or priestly class; the kshatriyas or warrior class; the vaishyas or trader class and the shudras or untouchables. The brahmins exploited the lower castes in the name of religion. They made expensive pujas (worship) complete with animal sacrifice a necessary part of Hinduism. This in turn kept many people out of its fold. Both Jainism and the more popular Buddhism, the most influential sects of the time, challenged these notions. That is why both preached equality. They offered the lower castes and the downtrodden hope and a place to belong. Both also condemn animal sacrifice strongly, the Jains going one step further and declaring even the inhaling of airborne germs while breathing, a sin. It is interesting to ask why these ideas became so popular at that time. The answer is simple: they made perfect sense at that time. The common people could not engage in the elaborate rituals that were an important part of Brahmanism at that time. Also, the rise in animal sacrifice was proving to be very expensive and was harmful to an agricultural society. Cattle was very important for clearing the land, ploughing the fields and milching. It was important that they not be killed in such large numbers. Most importantly, these ideas were expressed in Pali, a language/script that could be easily understood by large sections of the common people. Brahmanism relied on Sanskrit, the language of the few. Initially Jainism did not encourage idol worship, was against the caste system, especially untouchability, and preached equality. However, in times to come, as the religion grew and acquired more converts, it became complex. Different groups came up that began to interpret the teachings differently. Jainism never became as popular and widespread as Buddhism. This was because it was more strict about even common people maintaining its principals. Its adherents came mainly from the trading community. The religion which originated in the Gangetic valley, spread to parts of northern, western and southern India and continues to hold sway to this day. Who’s the Brainiest animal of Them All?